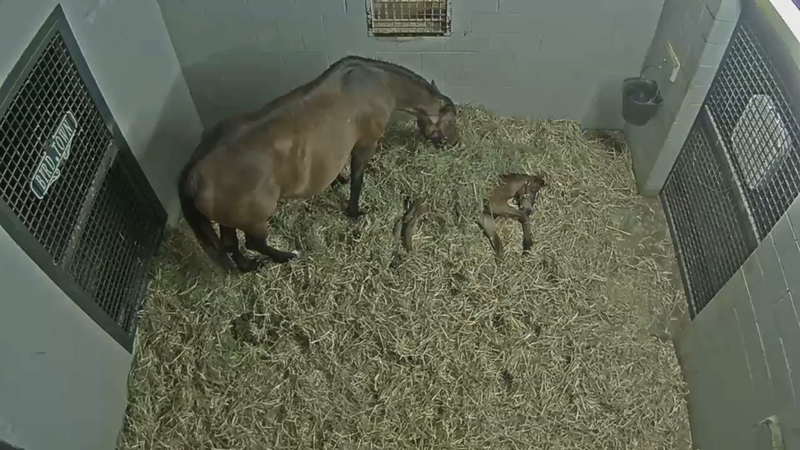 The weather has changed and so has the schedule for the foals. Most of the foals are now out in a paddock or a field all night, coming into the stall early in the morning for a couple hours. 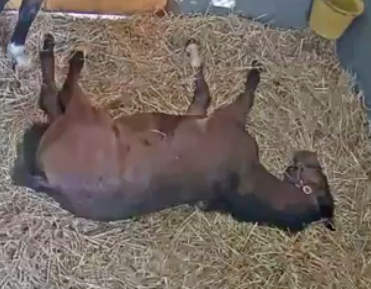 We’ve gotten a lot of comments from Foal Patrol fans who find it amusing to watch the foals come in and literally collapse in the stall! Clearly, they’re in need of some rest! 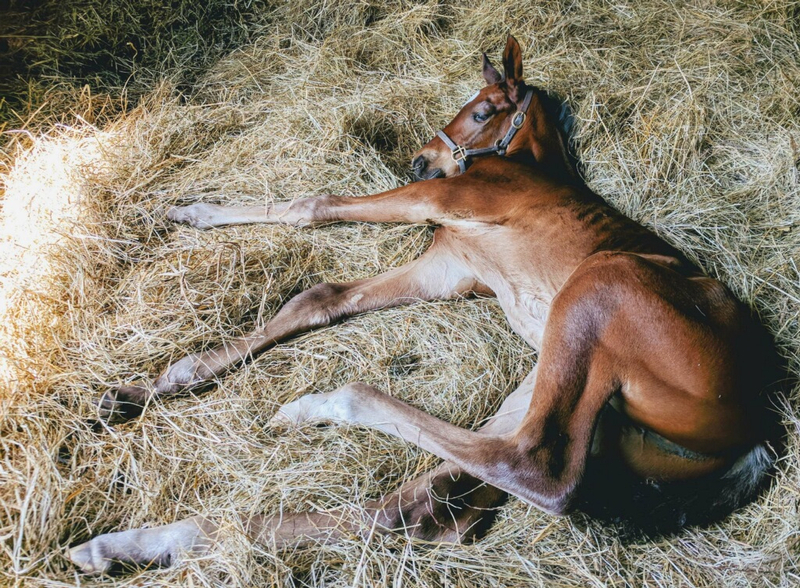 Foals will eventually learn to sleep standing, as their mother’s do. So, how does a horse sleep standing up? By design – a clever one at that-- the horse’s leg is a system of tendons and ligaments that work together with the kneecap. Animal experts call this the "stay apparatus” – it allows them to relax without collapsing. At any time, a horse needs only to relax the muscles on his front legs, and the stay apparatus will kick in. For the back legs, a horse must rotate its hips to activate the built-in locking mechanism. Horses may spend anywhere from four to fifteen hours a day in standing rest, and from a few minutes to several hours lying down. 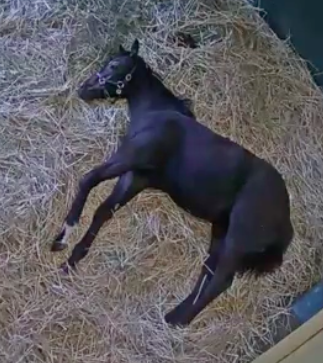 Sweet dreams Foal Patrol foals! Is he growing at a normal rate? 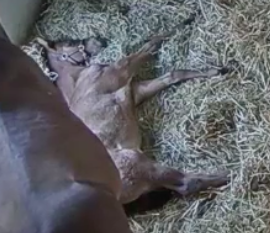 He looks huge, especially when he's in the stall with mamma. He is growing about the same as his other barn mates. He might look big in the stall because it’s staying the same size as he grows. How has his demeanor changed as he's grown? He used to have a biting habit that he’s been breaking him of. He said he’s gotten a lot better, but you have teach them while they’re young, or else they’ll keep doing it their whole life. Has he made new friends in the paddock? He’s friends with all of the other foals in his paddock. His two buddies are Vexed ’18 and Magical Moon ’18. Has he developed any funny habits? He used to be a biter but is starting to break that habit. Other than that, he really enjoys his feed and will go straight for the bucket once he’s fed! 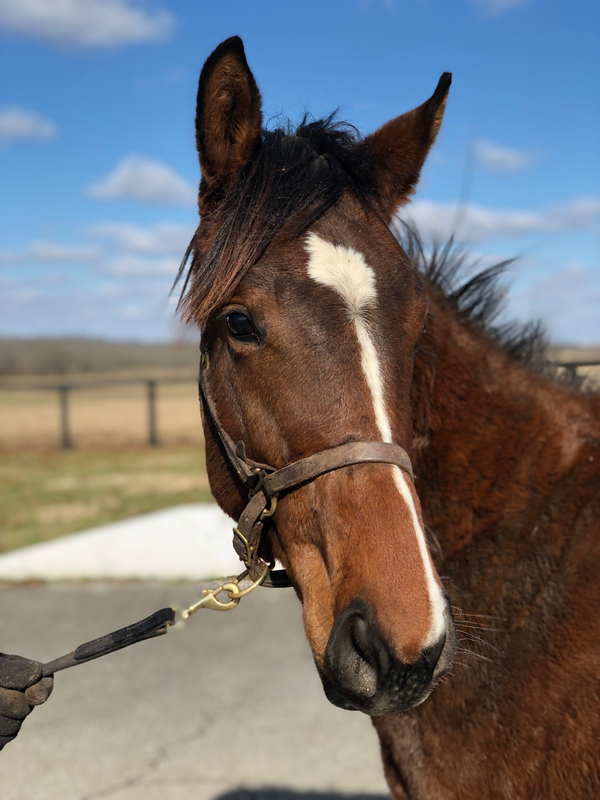 So far, he's the only Foal Patrol colt. 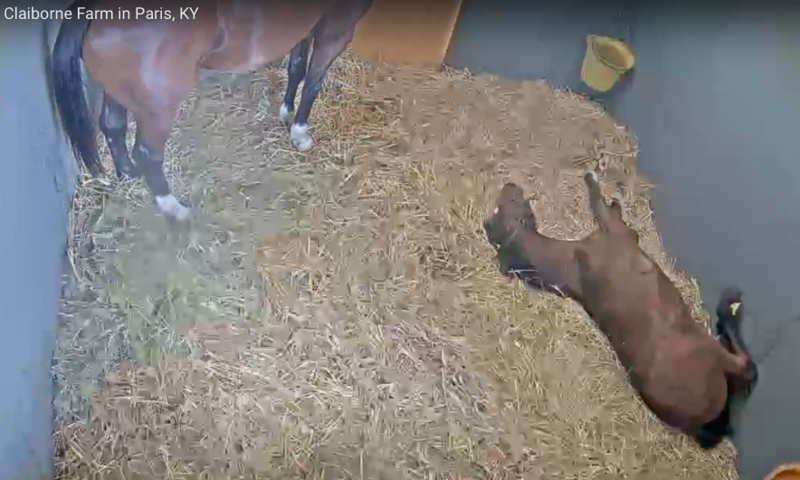 Do you think colts behave differently than fillies? Fillies are easier to raise because they’re not as playful with each other. As colts get older, they becoming rougher with each other. 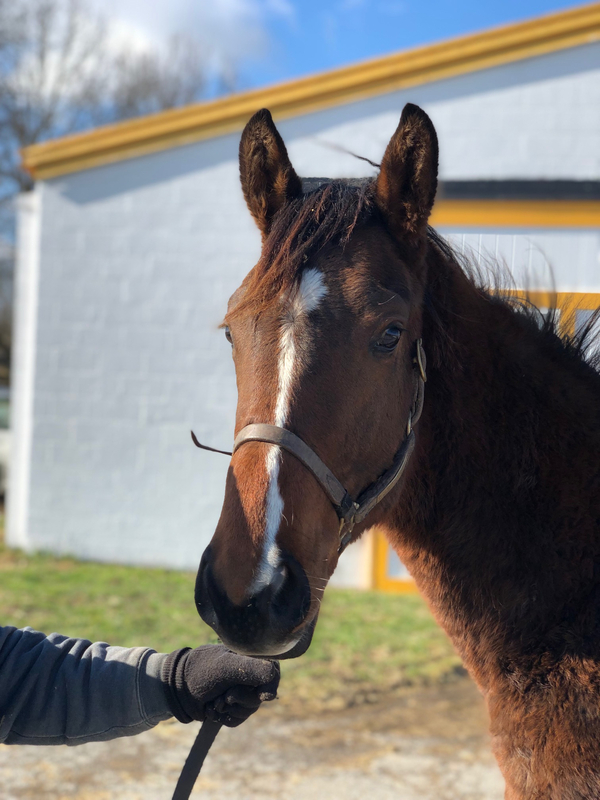 What is expected of a foal his age? In a couple of weeks, his mom will likely try to get him to stop nursing by nipping at him and pulling away. Then they will begin weaning. He’s still nursing but not very much because he’s also getting hay, grass, and feed.